The woods began to thin. In a stand of birches they came upon a battered roll-top office desk with a DEWEY FOR PRESIDENT IN '48 sticker on it, a stenographer's pad, a rolodex, and an old-fashioned phone - the sort with a receiver that looks like a tortured wooden daffodil from outer space. A glass jar of disgusting brown candies stood open to the air, and unfortunate insects that had passed over the mouth of the jar and died were scattered in a nubbly way, like bits of crumpled string, all over the ink-stained green paper blotter. A wooden filing cabinet, its open drawers over-crowded with files and spilling with papers, tilted against a tree. In the bottom of the howdah, Roberta remained on her back, twitching with curiosity but nervous in the presence of nastiness. Joe and Nancy peered over the edge of the conveyance. Nancy suddenly recognized the receptionist. It was Plenty Sassy, another of the elephants from the Sick and Tired Circus. Since when could she talk? For that matter, since when could Hathi talk? All these gabbling creatures in the Circus, biding their time, minding their tongues, year after year, while Joe and Nancy had felt so alone! Together, of course, but alone . . .
“I need to use the little alien's room first. 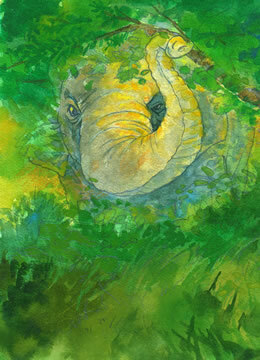 It was a long trip,” said Hathi. “I'm good at watching but I'm not as practiced at listening,” said Ms. Hunch. “Eavesdropping is sneaky and morally dubious,” said Nancy. Using her supple, elegant proboscis she prodded the branches. With a twitch of her nasal digit, she lifted a branch, like lifting a slat in a Venetian blind, so they could all see. The yolky light took some getting used to; Joe and Nancy squinted against the brilliance. Their eyes drifted to the left and right. What they saw looked like a wardrobe from a B-grade monster film. That is, after shooting has stopped. After the starlets and studlets have gone off to the canteen to get a beer, because the production values are lousy and the script is senseless and the budget has been cancelled and the whole operation has been shut down. And the cast has been let go. And they haven't taken good care of their costumes on their last day because why should they. This is to say the trees and bushes were draped with dreadful pelts. A scattering of wolf-skins, with glassy, artificial eyes like plastic olives. A sort of squid-sheath to which a likeness of a human head had been mounted. And behold: that objectionable couture known as Leonardo Dubenski, laid crossways on a boulder because it was hard to know which end was up. To say nothing of a couple of crones, a laughable Frankenstein noggin that wouldn't scare a kindergartner, some flea-bitten vampire capes and dentures complete with overbites, a half-dozen full-body clown costumes, and the likeness of a dental technician with death in her eyes. “Not quite cooked yet?” said Joe. It was true; the matter was only partly congealed, and ranged from a rubber-cement transparency to a gluey, translucent white. Edges of the Eggy-Thingys raveled, broke off and orbited nearby like bits of suds until they gravitated slowly back and reattached. “Plenty Sassy didn't send out the hold-the-date notices in time,” muttered one of them. 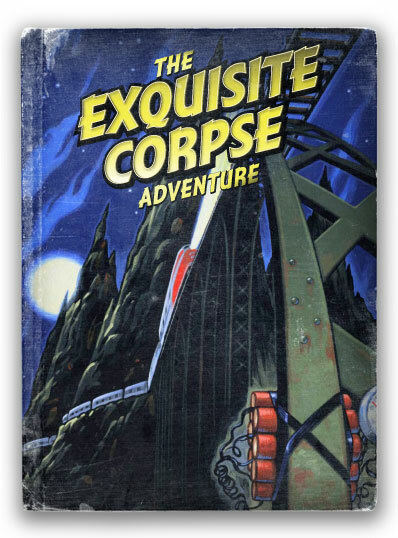 Sybil Hunch raised her eyebrows and poked the kids in the ribs. They all must remain very quiet indeed. “No time for personal comments,” said Eggy Senior. “We have a quorum. Not that we need a quorum, because I'm the boss and a very fine and naughty dictator, if I do say so myself. And whoever arrives late will have to stay after and clean up the refreshments. So ha ha and boo-boo on them. Now. First, I'd like a report from number 17 - the agent who goes as Boppo the Clown.” As he spoke, the yolky heart of him blurred with mouthing motions. Like a sock puppet made from a room-temperature coconut custard. On the loose and floating around, looking for trouble. “Narcolepsy,” said someone else, witheringly. They all laughed bitterly, and shook when they laughed like a bowlful of - well, never mind. “Sassy, make a note of that,” called Eggy Senior. “I already did. With a pencil. Gotta love the technological revolution!” she bellowed. “Are you kidding? We're talking Boppo. He's already disfigured enough.” They shook with laughter again, coming dangerously close to scrambling themselves. Even Joe and Nancy snickered, which was something of a relief after all this tension. It was pretty funny. Sybil Hunch pinched them both, hard, to make them stop. “Bring out the prisoner!” cried the other aliens. Joe and Nancy glanced at each other. Mom? Dad? Baby Max? But they were all in another dimension, weren't they? Still, their hearts leapt up. Just in case. “The prisoner!” chorused the Eggy-Thingys. They heard the rustling of leaves and the snapping of twigs. The secretary elephant lumbered into the clearing carrying a kind of birdcage. Inside it, hunched and smaller than he had once been, squatted Einstein. “I thought he was only a projection of Genius Kelly!” Joe was merely mouthing, but Nancy telepathically - and through the movement of his lips - could tell what he meant. She shrugged. Who knew? But seeing Einstein again - loopy and dear as he'd seemed - felt like meeting up with a long-lost grandfather. That is, given the scarcity of other close relatives to cherish. With the tiniest of beeps, Roberta made a kind of mechanical purr. She must be recognizing Einstein, too! Sybil Hunch put a calming palm upon Roberta's headless shoulder. “Oooooooh,” said the other Eggys, nudging one another with their elbows. Sort of. If you can think of giant partly-poached eggs hovering in a forest clearing as being able to give elbow. “Time is of the essence to a three-minute egg,” said the leader, at which they all chortled - apparently an old joke, but they seemed to react as if to say, Aren't the old jokes the best? Joe and Nancy rolled their eyes at each other. This sounded like chatter from the old-time radio era of a yolk-a-minute comedy hour. The Einstein apparition spoke in a voice much more timid than when the children had first met him. Their hearts pounded to hear him so frail. “It seems that the children have found Roberta's heart and her mind,” said Einstein, and allowed himself a bitten-off smile. Roberta gave a mechanical thumbs up. “Ooo-oooh,” said the Eggy-Thingys. They had never thought of this. And out he went, like a candle. No blue radiating glow where he'd been this time. Just emptiness. The Eggy-Thingys began to mutter amongst themselves. They looked like a giant floating Baked Alaska, except lit with the light of their inner badness. Plenty Sassy lurched forward pushing a trolley with her trunk, but Sybil Hunch guessed that the Eggy-Thingys would need to dress in their corporal disguises to be able to help themselves to tea and some vile little cookies. 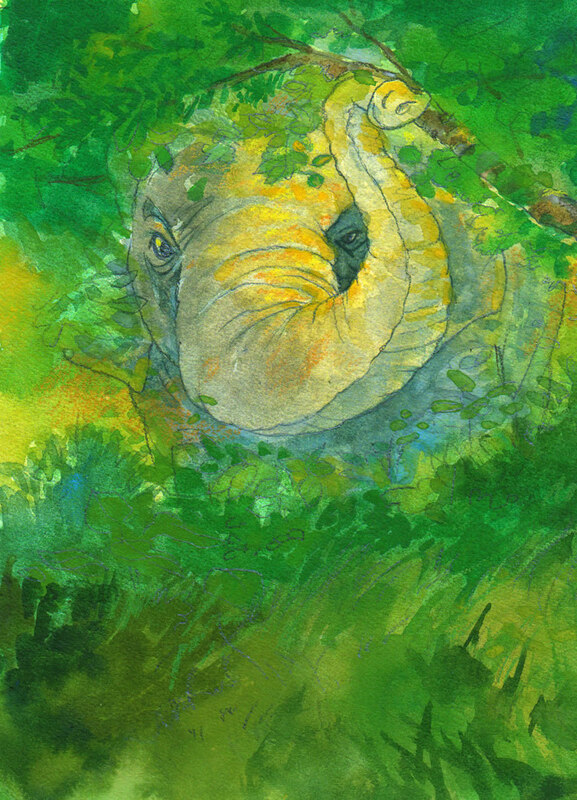 Sybil Hunch tickled Hathi behind her right ear and made a motion with her head, as if to say, Outa here, sister. “While they snack,” thought Nancy, “could we steal a lead?” Although stealing is generally considered unsavory, morally speaking. Hathi backed up delicately, stealthily. For the first time in quite a while, the Sloppy kids heard no sinister voice mocking or cursing or threatening them from the next chapter. Just the silence - it trembled strangely in the tree limbs with its own particular gravity - of the evaporation of something that had resembled a human soul. They didn't speak. Every death - the death of hope, of fondness, of an enemy or a friend, even the death of an apparition - deserves a little respectful silence.